When Beneath The Planet Of The Apes ended with a nuclear bomb blowing up Earth, that was supposed to be the end, which might have worked. Though far less satisfying than Planet Of The Apes, Beneath does at least close off any questions left open by its predecessor, extinguishing Planet’s glimmer of optimism with a big bang and a long silence. 20th Century Fox and producer Arthur P. Jacobs saw it as the end of the line. Filmgoers didn’t, despite seeing the planet snuffed out: apes, mutants, and all. The film was a hit. Thinking he was done with the whole apes business, screenwriter Paul Dehn—film critic; World War II spy; poet; playwright; lyricist; librettist; and adapter of Ian Fleming, John LeCarré, and Shakespeare—planned to move on. Then, as he told Cinefantastique in 1972, he received a four-word telegram: “Apes exist, sequel required.” The only thing the message got wrong was the word “sequel,” singular: Dehn was soon working on the third, fourth, and up to a point, fifth Apes films. It was unknown territory in a number of respects. The height of the studio system produced series that ran for film after film, following Andy Hardy or Charlie Chan through one adventure after another, but by the 1960s, film franchises weren’t common, outside of Toho films starring Godzilla, or Hammer horror movies with Dracula and Frankenstein. Apart from the James Bond series, major studios produced the occasional sequel, but didn’t yet think in terms of ways to exploit the same characters via a string of movies. And, unlike the James Bond films, the Apes series didn’t have the relative luxury of more or less rearranging the same familiar elements each time. It couldn’t. It had blown up the world. For the next three films, Dehn and others essentially redefined what sort of movie they were making with each successive entry, beginning with Escape From The Planet Of The Apes in 1971. Where previous entries used the future of the Apes world to contemplate the state of things in the 20th century from a distance, Escape erased the distance by dragging apes into the America of the near-future, specifically 1973. 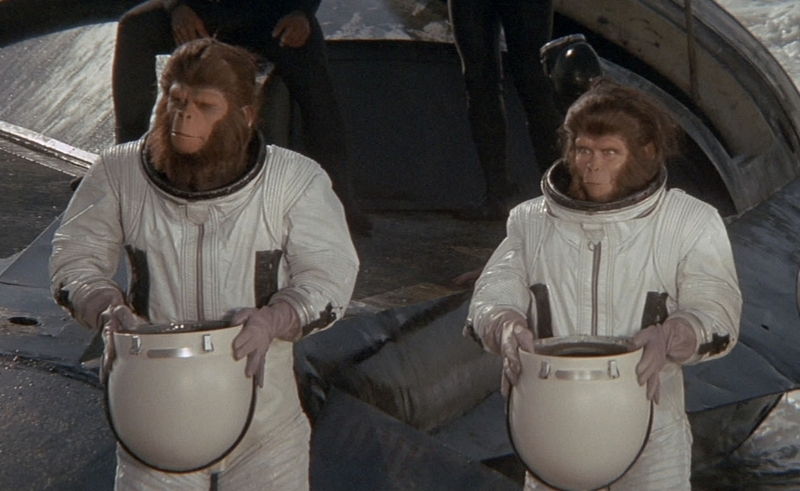 That’s one year after Taylor and the other astronauts left on the journey that took them into the ape-dominated future, so it would make sense for chimpanzees Cornelius (Roddy McDowall, returning to the series after skipping the previous installment), Zira (Kim Hunter), and Dr. Milo (a new character, played by Sal Mineo in his final film role) to have it as their destination after they rig up Taylor’s spacecraft to travel back in time. It’s also close enough to what was then the present to allow the film to double as a sly social satire, at least for a while. Splashing down off the coast of Los Angeles, the chimps are taken to the Los Angeles Zoo, where everyone is astounded at the way they set up housekeeping and breeze through intelligence tests. (It’s a conceit of the later films that the various chimps, gorillas, and orangutans look like actual chimps, gorillas, and orangutans, and not humans wearing ape makeup. As brilliant as the makeup is, this is never the case. Nonetheless, it’s best just to go with it.) Though they’ve vowed to keep their ability to speak a secret, this vow doesn’t last long, and they soon astound Lewis (Bradford Dillman) and Stephanie (Natalie Trundy), the scientists charged with their care. Dr. Milo is killed by a gorilla shortly after that, leaving Cornelius and Zira as the last of the talking apes. The smart play would be to keep a low profile. Another possible smart play: Don’t let on that they come from the future at all, and pretend to hail from, say, some kind of planet of the apes. Those aren’t the courses they pursue, however. Instead, they reveal their ability to speak and much of what’s to come on Earth, while attempting to keep secret their own relationship with Taylor, and the treatment humans will receive at ape hands. For a while, it works. Cornelius and Zira become celebrities, making the publicity rounds, dressing up in fancy human clothes, and weighing in on early-1970s hot topics like women’s lib. During this stretch, Escape becomes, by far, the most lighthearted of the Apes films. Director Don Taylor doesn’t bring in much visual style: An actor-turned-director otherwise best known for directing Damien: Omen II and The Final Countdown, Taylor spent much of his career in television, and the film has the flat, over-lit style of the era’s TV shows. But Hunter (in her swan song behind the prosthetics) and McDowall have fun with the material, fleshing out the relationship between Cornelius and Zira and giving it depth and warmth unmatched by any of the human characters. It’s a cruel setup for what comes next. Zira and Cornelius are dogged by presidential advisor Otto Hasslein (Eric Braeden), who suspects they know more than they’re saying about Taylor and the dark days to come. When Zira, now pregnant, spills the beans about the future—a plague that kills dogs and cats, apes kept as pets, then as servants who eventually rebel, then nuclear disaster—she seals their fate: Her pregnancy is to be ended, and she and Cornelius are scheduled to be sterilized. They escape to live as fugitives, seeking shelter with kindly circus owner Armando (Ricardo Montalbán), who boasts of his love of all animals and of a chimpanzee who’s recently given birth under his care. Their haven proves short-lived, however, and after escaping and hiding out in an abandoned ship, Hasslein tracks them down. He guns down Zira and a chimp baby that appears to be her newborn child, Caesar. Cornelius shoots Hasslein, and is killed by a sniper in turn. So the door remained open, leading to Conquest Of The Planet Of The Apes the following year. Watching that film today, two things are clear: It’s the second-best installment of the original series, behind the original film, and it’s hard to believe it ever got made. Where past films had political themes, in this case, the subtext is barely subtext at all. Set in 1991, 18 years after Escape’s action, it again stars McDowall, playing the part of a grown-up Caesar. Armando raised him and kept his ability to speak secret from the world. He’s also been largely sheltered from what the world has become: One in which apes have essentially become slaves, traded as property and treated as subhumans. Armando’s death and other circumstances force Caesar to join the general ape population, where he experiences humanity’s cruelty firsthand, and begins to plot an ape uprising, which he does with frightening ease. The film’s final act is filled with scenes of organized ape insurrection, as Caesar and others let the humans’ tendency to underestimate them work to their advantage, squirreling away guns and knives, then waiting for the right moment to strike. When they do, the film turns into one scene after another of apes slaughtering humans, in images inspired by the Watts riots and by the black revolutionaries who’d made their voices heard so loudly in the years before the film’s release. J. Lee Thompson, director of Cape Fear and The Guns Of Navarone, stepped behind the camera for Conquest, bringing the series its strongest visuals since the first film, despite a limited budget. To cover up for shortcuts taken with ape makeup, the movie filmed largely at night, and to create the future, it turned next door to Century City. A Los Angeles district that had been a Fox backlot just a decade previously, Century City was filled with newly constructed buildings that seemed to anticipate an ugly, blocky, relentlessly tan future to come. It looks like a world worth burning to the ground. Thompson did just that. He first produced a director’s cut—now available on Blu-ray—that was deemed unreleasable because of its graphic violence and an unsparing final scene in which Caesar declares that mankind’s time is over. The version released to theaters dials back the concluding rhetoric a bit, awkwardly giving Caesar a last-minute change of heart and telling the apes under his command to stop the violence. It’s a bit of a cop-out—and the editing of the revamped scene is awkward—but the series’ overall structure makes even the compromised ending pretty grim. The circle has begun to close. Everyone is heading to the apocalypse that ended Beneath The Planet Of The Apes. The Apes series continued, but its bleak ending was only postponed, not prevented. The series could (and should) have stopped there, as a flawed but ingenious quartet that reinvented itself with each entry. 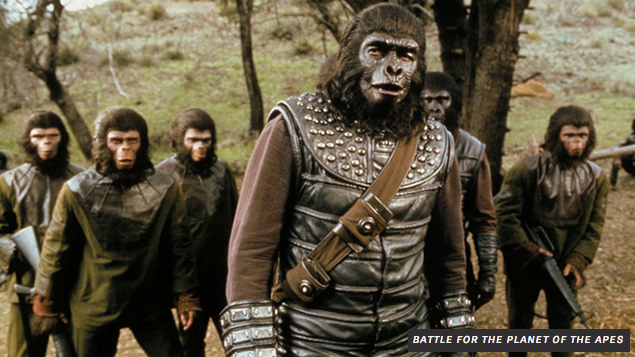 Instead, it overstayed its welcome with 1973’s Battle For The Planet Of The Apes. Though Thompson returned to direct, the ailing Dehn, who died in 1976 at age 63, had to give the script over to John and Joyce Corrington, the husband-and-wife team behind The Omega Man. (Dehn returned to the project later, with a few suggestions.) The series’ fifth film suffers from budget constraints and creative exhaustion, moving the larger story forward by inches without really doing much new with apes or humans. After a prologue from fabled orangutan The Lawgiver (spoken about in previous films, but never seen, here given life by John Huston on what must have been one of the more curious days of his career), the film depicts life a few years after the events of Conquest. Apes have conquered, and humanity has foolishly retaliated with nuclear weapons. Yet at least some humans and apes are living together, with Caesar presiding over the fragile peace and attempting to create a utopian future. “Ape shall never kill ape” is the law of the land. By the end of the film, the law has been broken, the dregs of humanity have launched an unsuccessful attack on what will become Ape City, and humans and apes are again attempting to live in peace. Battle contains the beginnings of a good idea, one that reintroduces the question of whether fate can be unwritten. The final scene returns to The Lawgiver and features human and ape children playing together centuries after the main events of Battle. But it closes with an image of a statue of Caesar, zooming in on a single tear running down the statue’s face, suggesting that this peace, too, will end. It’s a corny way to suggest the harmony won’t last, albeit one that keeps with the series’ relentless pessimism. But did we really need that reinforced? The problem with Battle is that it never feels necessary in any way. Even with a cast expanded to include Claude Akins and Paul Williams, the story feels like it’s been told already. In Planet Of The Apes Revisited, an exhaustive look at the series published in 2001, authors Joe Russo, Larry Landsman, and Edward Gross reconstruct Dehn’s original notion for the film, which was filled with backstabbing and internecine plots. While it certainly sounds preferable to the flat final product, even that film sounds inessential. Where the series was once a model of invention, and each film has its own distinct characteristics—it’s worth noting that 2011’s excellent Rise Of The Planet Of The Apes looked to Conquest for inspiration while largely ignoring the other films—Battle felt, for the first time, like more of the same. Beyond their artistic virtues, the Apes films broke new ground by demonstrating how a series could keep going after an apparent conclusion by creating successful spin-off products. By the time of Battle, the series had produced toys, comics, storybooks, lunch boxes, and more. After Battle, short-lived live-action and animated Apes programs followed. Even before Star Wars changed the game forever, the Apes films offered a model of how a movie might become more than just a movie, even if too many sequels and spin-offs resembled the warmed-over final film. In other respects, the series’ legacy is tougher to assess. Recent revivals, from Tim Burton’s forgettable “re-imagining” in 2001 to the much stronger Rise Of The Planet Of The Apes, have brought the series back into the spotlight, with the latter attempting to engage some philosophical concepts while still offering the spectacle of rampaging apes. But while the original film helped usher in an era of thoughtful, downcast, politically engaged science fiction, and the sequels helped sustain it, no one’s ever outdone the series. The Apes films used our closest relations to mirror humanity, daring to ask what sets our species apart from the rest of the animal kingdom and offering no comforting answers, even concluding by the fourth film that the world might be better off without us. (Or at least, it might be better off with a violent uprising from the oppressed among us.) All this took place within the context of action-adventure films presented as entertainment that kids and grown-ups could enjoy together. No one has since created anything comparable for the big screen. It’s hard to imagine anyone even daring.